These are the simple yet deeply poignant words of author, teacher and activist, Sobonfu Somé —one of the foremost voices in African spirituality to come to west. Destined from birth to teach the ancient wisdom, ritual and practices of her ancestors to those in the West, Sobonfu, whose name means “keeper of the rituals” travels the world on a healing mission sharing the rich spiritual life and culture of her native land Burkina Faso, which ranks as one of the world’s poorest countries yet one of the richest in spiritual life and custom. It is this reliance on spirit, community and ritual that has allowed Sobonfu’s personal and professional path to become one. 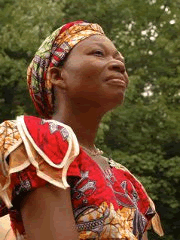 Since the beginning of her journey in the West Sobonfu has traveled extensively throughout North America and Europe, conducting workshops on spirituality, ritual, the sacred and intimacy. Her work has moved African spiritual practices from the realm of anthropology, to a place alongside the world’s great spiritual tradition, with a message of profound significance and practical application in the lives of Westerners. Sobonfu has written two books, “The Spirit of Intimacy” (William Morrow) and “Welcoming Spirit Home” (New World Library), her newest offering which draws on rituals and practices involving community, birth miscarriage and children.